skobbler is teaming up with the iPhone and OpenStreetMap communities to make expensive sat nav and costly, out of date map updates a thing of the past. 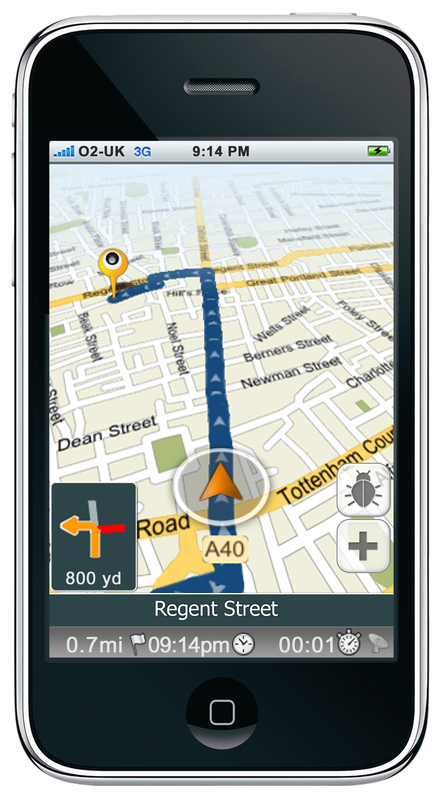 The iPhone 3G and 3GS compatible sat nav app skobbler is available to download for FREE at the UK App Store now. The skobbler concept has already sent shockwaves throughout the established navigation industry with competitors across Europe and US drastically cutting their prices to try and divert attention away from what is bound to be ‘the future of sat nav’. And with good reason: skobbler navigation hit the No.1 spot in the US navigation app charts just last week and has been the best-selling navigation app in Germany for more than six months. skobbler opens up the world of mapping to keen navigators, sat nav fans and anyone who wants to experience a sense of community pride and ownership, knowing that their map updates are helping to build a market-changing map solution. It is a community driven sat nav solution that empowers consumers to make outdated and poorly detailed maps a thing of the past. skobbler uses free maps from OpenStreetMap (OSM), the Wikipedia of maps that already has over 250,000 users worldwide dedicated to updating and creating the most detailed free map of the world. As a result, all users benefit from consistently updated maps without paying for expensive and already out-of-date updates. Complete data is already available in a multitude of areas, including London, where maps are as detailed, if not more so, than commercially available maps, thanks to the constant input and updates provided by the dedicated OSM community. skobbler users are invited to update and make corrections to existing data and create new mapping data for all to share. Various map editors are already available for this process on the web that cater for all user skill levels. All updates are uploaded and made available to all skobbler and OSM users, quickly and free of charge. skobbler enables drivers and pedestrians to play a direct part in a nationwide (if not worldwide) collaborative mapping project. This is already the future of digital maps and will be the future of sat nav. skobbler is also available with the addition of stationary speed camera alerts and no advertising for £1.19 via the App Store. skobbler is also currently rolling out in North America and will be made available across Europe and Russia later in the year. skobbler is free and is available on the App Store at http://itunes.apple.com/us/app/skobbler-uk-ireland-lite-truly/id374083118?mt=8. The skobbler app is compatible with iPhone 3G and 3GS. You can find further information on recent developments at http://blog.skobbler.com. skobbler has topped the navigation category in Germany’s Apple App Store sales charts for more than six months. Sales figures exceed 150,000 units, making it the top-selling navigation app in Germany. skobbler will be made available internationally (Europe, US, Russia) during Q2/Q3 2010. OSM is a free open source project that follows a crowdsourcing approach (it is often called the “Wikipedia of maps”). The OSM mappers constantly add new free information to the map and continuously improve its quality. New streets and points of interest are added by the minute and displayed on the OSM map. There are currently already more than 250,000 registered mappers around the world and numbers are rapidly increasing. Since 2004, the number of registered mappers has increased ten-fold every 18 months. Especially in most urban areas in Western Europe, the OSM map has already reach a level of detail which is matched by hardly any other corporate map in the market. “In the end, well set-up crowdsourcing beats any corporate approach when it comes to data-intensive projects in domains that are freely accessible. Wikipedia shows just that”, says Marcus Thielking, co-founder of OSM-based technology provider skobbler GmbH.